When you talk about hidden gems, Gloss Mountain should be the cover shot. As you pull up to the state park, you almost feel as if your driving into Utah. Beautiful, red rocks that glisten in the setting sun, green grass and golden hay straws overgrowing the red clay mountains makes it hard to not at least stop by for a day visit. We were driving through Oklahoma on our USA road trip and stopped here for about two hours. We were blown away. 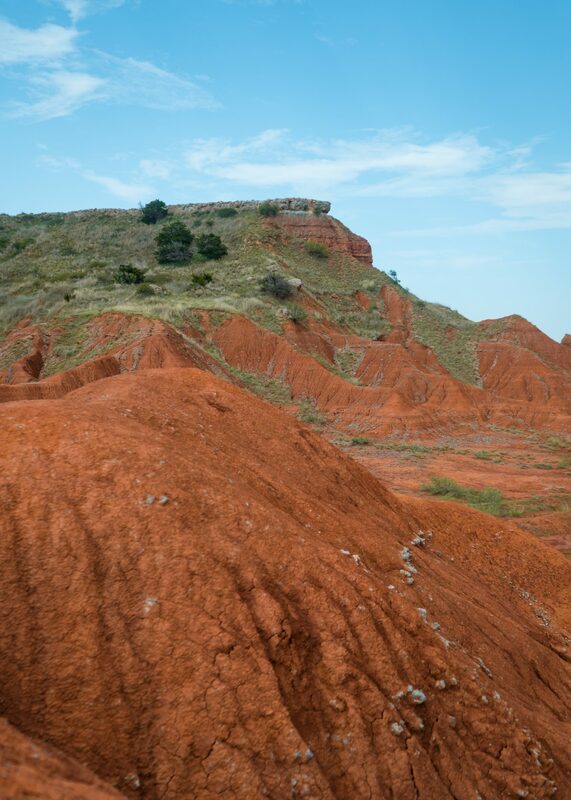 Gloss mountain is located an hour west of Enid in a rural town known as Fairview, off of Highway 412. The park is open from 7 Am- 9 Pm. As we said in the introduction, we stopped by here on our trans-USA road trip. We were honestly going to drive straight through Oklahoma before we came across this beauty. So if you’re ever driving through Oklahoma we would highly recommend stopping by here for a quick hike and picnic. Hiking – There is only really one true hiking trail to accomplish in Gloss Mountain: Cathedral Mountain Trail. It’s an easy hike, racking up a short distance of 1.2 miles with a total elevation gain of a 150 feet. The trail starts right in front of the parking lot, where you climb a good 100 steep steps. Luckily, there are quite a few benches to stop and rest on. At the end of the stairwell you do have to grab onto a rail and pull yourself up over a few rocks. This could be difficult for anyone with back problems or shoulder issues. However, with an extra hand you should have no problem. After that, it’s a short loop around the beautiful, shiny mountains. The hike is open year round. We would recommend keeping an eye on the weather if you travel during tornado season (late spring-early summer). Photography – If you’re into photgraphy as much as we are, then you better stop by Gloss Mountain. Sunsets are out of this world here, giving you colors that will make you want to visit this location every time you return to the Twister State. Pink and yellow tones bounce off the orange, rugged mountains, illuminating the Selenite deposits like diamonds. Not to mention this is one of the best areas to capture astrophotography in the state of Oklahoma. Catch blue hour, stars, and even the Milky Way here! Picnics – The park has added pavilion’s, grills, restrooms, and even benches throughout the hike. Bring some food, a blanket, and a nice bottle of wine. Set up shop and watch the sun go down. This park is perfect for picnics! Stargazing – As we mentioned earlier, Gloss Mountain is one of the best locations in Oklahoma to view the night sky. Its rural location makes it one of the darkest areas in the state. Bring a blanket, lay out and gaze at the constellations at this unique location. Longdale Campground, located 30 minutes south of Gloss Mountain State Park, is open year round and hosts 35 primitive campsites. You can reserve your spot up to two days in advance, or pull up to one of their first-come, first-served sites. For those who arrive first-come, first-served, a self-pay deposit box is located by the gatehouse. The site includes water, pit toilets, a picnic pavilion, and is located on a river. November 1st-March 31st, there is no camping fee due to water being turned off. Although the rural, nearby town of Fairview doesn’t boast any luxury hotels or resorts, there is a Best Western and a few motels to spend the night at. If mediocre hotels aren’t your thing, check out some of the AirBnB’s in the area. We fell in love with this 4 bedroom ranch house, complete with uninterrupted views of the rolling hills surrounding the property. New to AirBnB? Use our code to sign up and receive $40 off your first stay! Have you ever been to Oklahoma? What’s a state you’ve driven through that surprised you with it’s beauty?